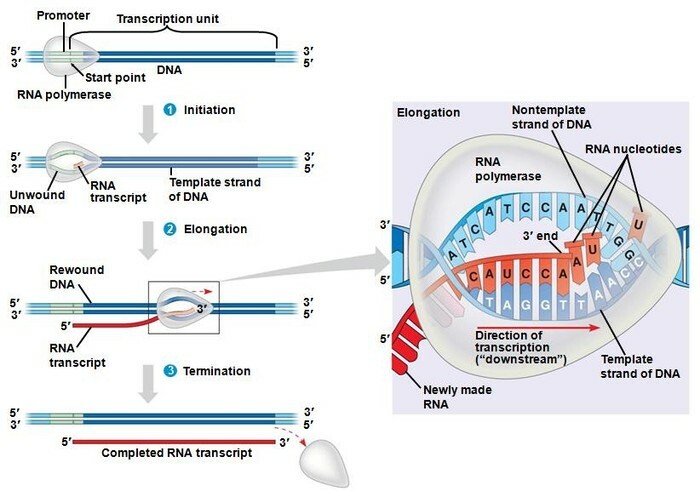 Transcription occurs in three steps, initiation, elongation, and termination. 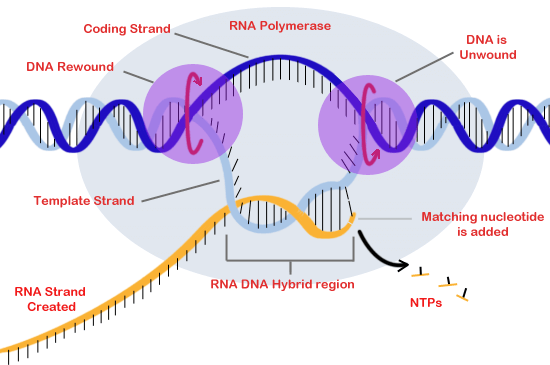 *initiation is when after RNA polymerase binds to the promoter, the DNA strands unwind, and the polymerase initiates RNA synthesis at the start point on the template strand. 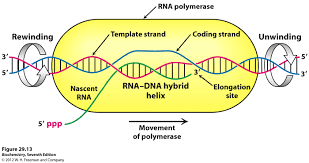 *The polymerase moves downstream, unwinding the DNA and elongating the RNA transcript 5'>3'. In the process of transcription, the DNA strands reform a double helix. *In the process of termination the RNA transcript is released and the polymerase detached from the DNA. The whole process of transcription occurs in the nucleus. Transcription is writing/copying a new 'gene' from the template so it will be identical to the previous gene, the product is called the pre-mRNA. This occurs in the DNA, the RNA polymerase unzips/unwinds the DNA double helix and matches the template with its corresponding bases. The C bases pair with the G bases and the A bases pair with the U bases. This all occurs in the nucleus, but the pre-mRNA leaves the nucleus. 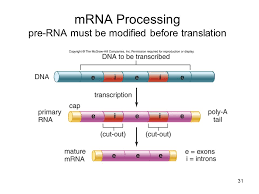 The process of transcription produces the pre-mRNA, which is the completed RNA transcript. The DNA sequence where RNA polymerase attaches and initiates transcription is known as the promoter region. 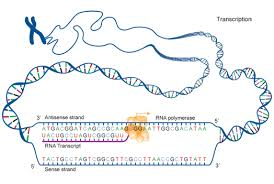 The stretch of DNA that is transcribed into an RNA molecule is called the transcription unit. A TATA box is a nucleotide sequence containing TATA bases, about 25 nucleotides upstream from the transcriptional starting point. RNA polymerase transcribes a sequence, which codes for a polyadenylation signal (AAUAAA) in the pre-mRNA. Then, at a point about 10-35 nucleotides downstream from the AAUAAA signal, proteins associated with the growing RNA transcript cut it free from the polymerase, releasing the pre-mRNA. After transcription, the RNA that is synthesized in this process is then moved to the cytoplasm, to be translated into a protein. However in eukaryotes it is not immediately ready, as Eukaryotic mRNA requires extensive processing. This processing helps the RNA molecule to be recognized by molecules that mediate the translation of RNA into proteins, and cuts out portions of the RNA chain that are not supposed to be translated. Capping occurs very early during the synthesis of mRNA. Capped mRNAs are very efficiently translated by the ribosomes to make proteins. When the RNA chain is about 30 nucleotides long, the 5' ends are modified by the addition of a guanine group in the opposite orientation. This modification leads to the formation of the cap, which works to protect the growing RNA chain from degradation. Then something called Polyadenylation happens. 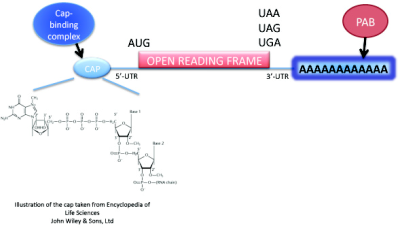 Nascent RNA is moved from the AAUAAA sequence by ribonuclease. The enzyme Poly A polymerase then adds adenine ribonucleotides up to 200 bases long at the 3' end of the RNA creating the the Poly A tail. This tail enhances the stability of the mRNA and regulates its transport to the cytoplasmic compartment. 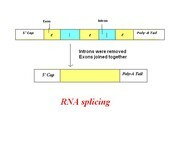 Splicing is the reaction that removes unnecessary segments of the RNA known as introns. The removal of the introns creates mRNA which contains only exons, which are portions of the RNA that will be translated into proteins. An intranuclear protein called the spliceosome helps to ensure proper splicing. 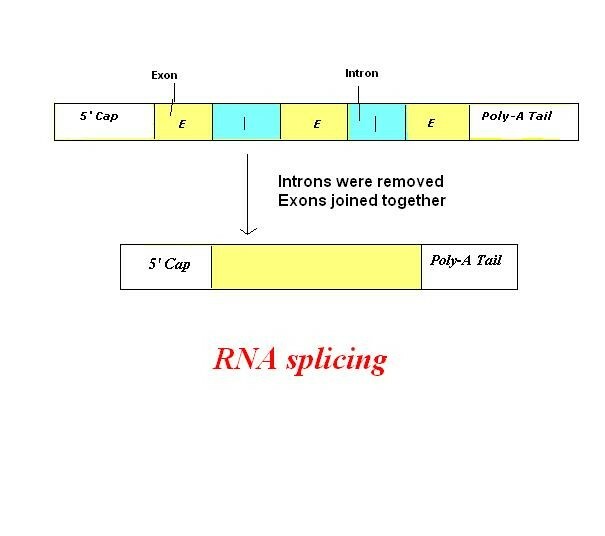 There are also three types of short sequences that dictate the precise cutting of the intron amd exon boundaries called splice junctions. These are the splice donor, the splice acceptor, and the branch site. Two sequential cuts occur, first the splice donor site is cleaved, then the splice acceptor site is cleaved. Finally the intron degrades and the two exons are ligated.